The old and messy methods of shaving and trimming are now a thing of the past. Maxel has for long provided you with various options of grooming. 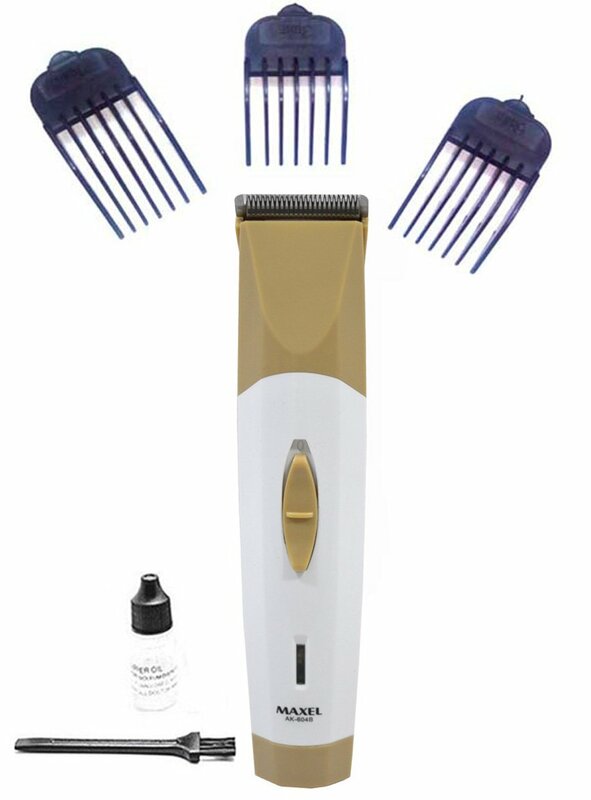 This Maxel Ak 604B Professional Hair Trimmer will surely be the ideal product for you. This company has brought to you many personal care appliances with the help of which styling has been made remarkably easier than ever. This trimmer will save your time and you will not have to go to a salon to get rid of the unwanted facial hair and tame your unruly beard. Get this product today as shopping was never so easy before. All you need to do is place the order and your Maxel Ak 604B Professional Hair Trimmer will reach you in a matter of days. *0.5 mm to 5 mm Precision The length settings can be adjusted from 0.5mm to 5 mm to get the desired shave. You can flaunt the three day shave or a perfectly cleaned shave look instantly. *Easy Grip The body is made of plastic and offers safety while it is plugged in. The rubber grip will provide your hands from slipping off and thus preventing your skin from cuts. *Stainless Steel Blades The blades are made of stainless steel which will provide longevity to the Maxel Ak 604B Professional Hair Trimmer. Stainless steel remains rust free and the sharpness does not get affected even after prolonged hours of contact with water. The sharp blades will offer the best and smooth cuts. *Rounded Tips The rounded tips of this trimmer help to get smooth trimming even at the curved areas like the chin. *Ergonomic Design The head of this trimmer is washable and can be cleaned easily keeping the blades safe for multiple usages. *Other Important Features It will give you a quick make over and will make you define a style statement of your own. For travelling too this Maxel Ak 604B Professional Hair Trimmer is recommended as it can be easily packed along with other luggage. To Recieve updates and possible rewards for Maxel AK 604B - Brown please sign in. To Recieve updates and possible rewards for Trimmer, Clipper & Shaver please sign in.